Who are the Marin Master Gardeners? Learn about this trained group of 300+ volunteers who share their knowledge and skills with home gardeners and community organizations - the UC Marin Master Gardeners. 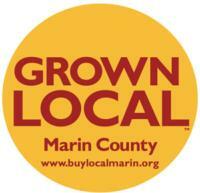 GROWN LOCAL Marin County is a collaborative effort of agricultural organizations and producers in Marin focused on building and supporting locally owned businesses in Marin. Check out this newsletter filled with expert tips and solutions for Marin gardeners, including seasonal advice, in-depth research-based horticulture resources, answers to common gardening questions, & solutions to pest and disease problems. Congratulations to Ellie Rilla and welcome Julia Van Soelen Kim! Like us on Facebook, subscribe to one of our newsletters, or join our general mailing list for all information.